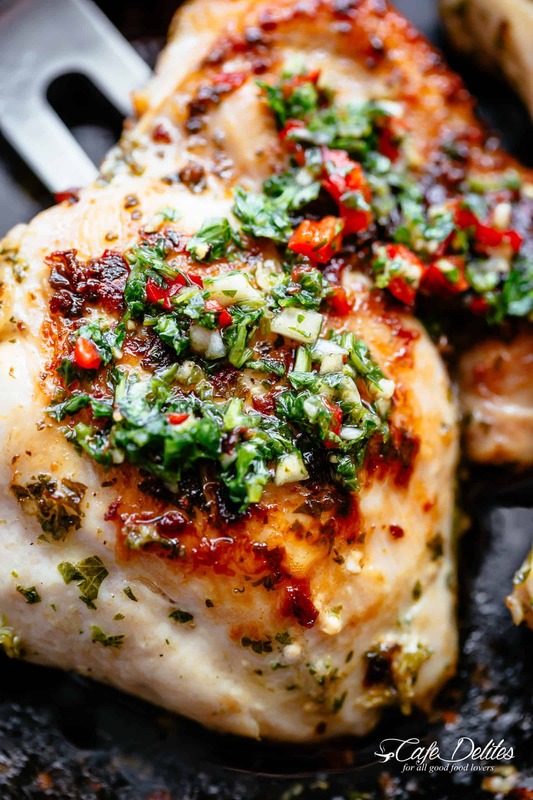 The Best Chimichurri Chicken, grilled or pan fried with authentic Argentine chimichurri! Chimichurri is growing fast in popularity and is the most perfect condiment to serve with your chicken or steak! 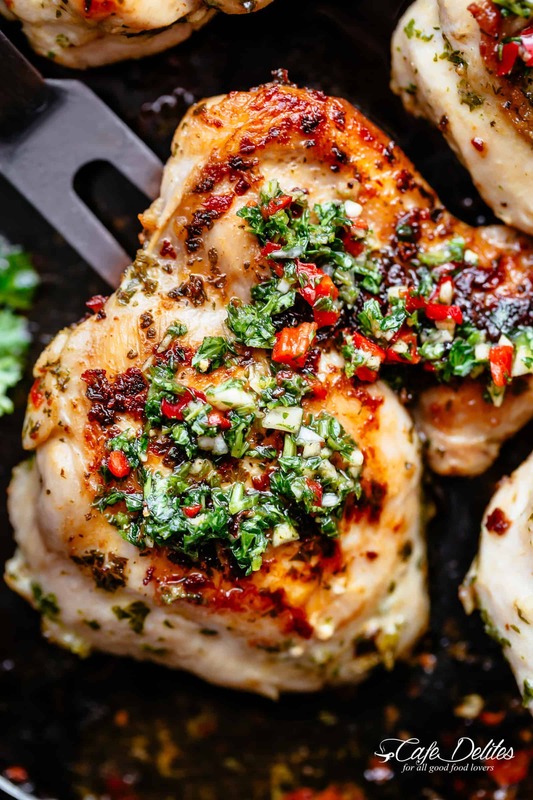 So easy to make and tastes incredible, your Chimichurri Chicken dinner is ready in minutes! 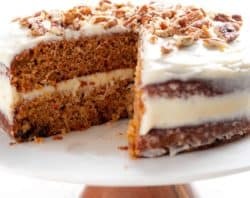 With only a handful of ingredients and NO food processors or blenders! Truth be told, in Argentina or Uruguay we don’t marinate or baste our meats in chimichurri…ever. Used solely as an accompaniment for your proteins, chimichurri is always served on the side of your plate to dip or pour over your meat. 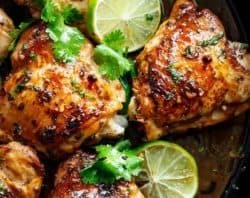 With this recipe, however, I convinced my father to try marinating some chicken thighs as they are a completely different flavour to beef, and to try the outcome. He is now converted…with chicken only. Don’t touch his steaks or yours though. If you’d lIke to see how we cook our steaks with chimichurri, see this link! Once you’ve made your chimichurri, marinate your chicken thighs for 20-30 minutes to really get all of those flavours in. I use thighs for this as they are guaranteed to stay succulent and juicy, but you can use breasts if you wish! 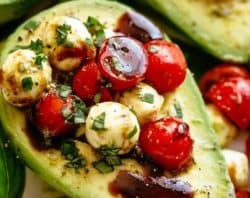 Serve with a simple tomato salad for a healthy, low carb, light dinner! Read more about our Authentic Chimichurri recipe here! 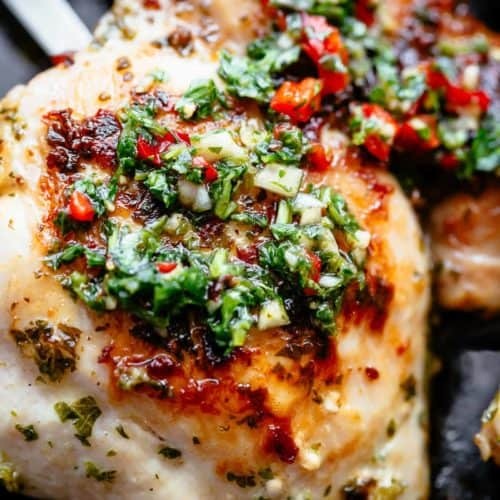 The Best Chimichurri Chicken, grilled or pan fried with authentic Argentine chimichurri! 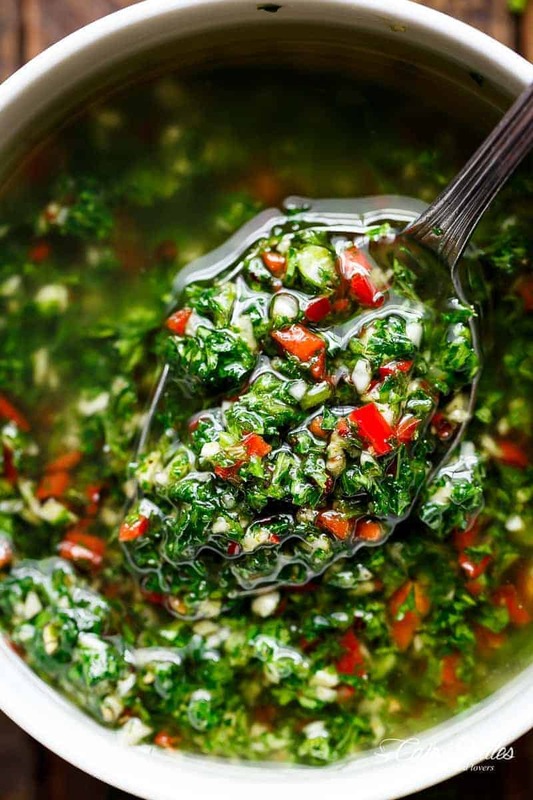 Chimichurri is growing fast in popularity and is the most perfect condiment to serve with your chicken! 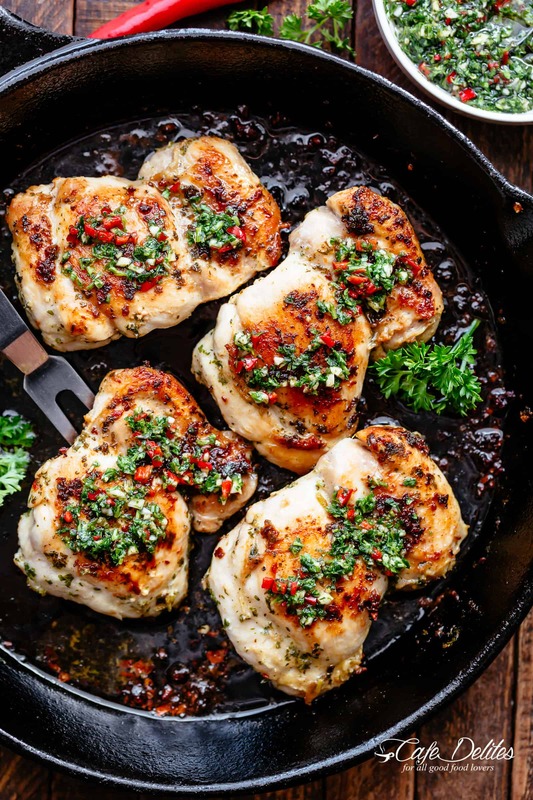 So easy to make and tastes incredible, your Chimichurri Chicken dinner is ready in minutes! 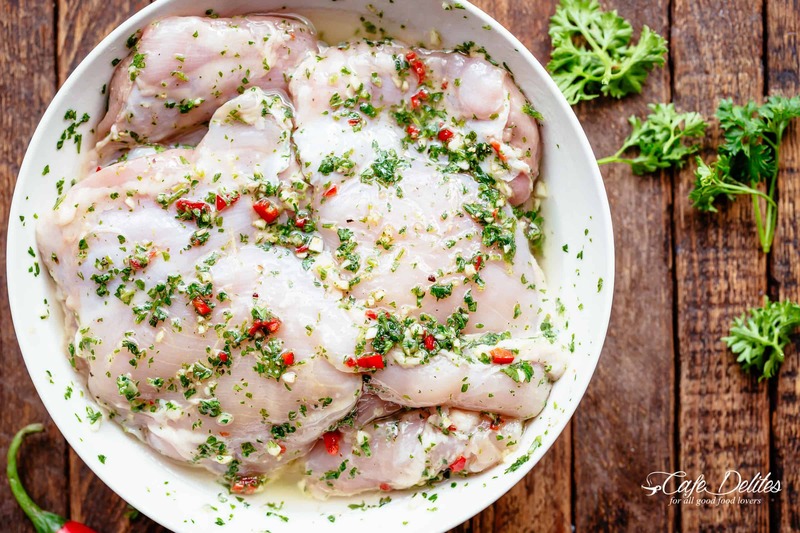 Season chicken with salt, pour 4 tablespoons of Chimichurri out into a shallow dish and coat chicken. Allow to marinate for 20 minutes (if time allows). Reserve untouched marinade to serve later. 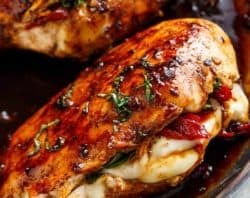 Heat a small amount of oil in a grill pan or skillet over medium-high heat and cook chicken fillets on each side until golden, crispy and cooked through (about 5-6 minutes each side). Once chicken is cooked, set aside and allow to rest. Spoon remaining chimichurri over each chicken thigh (about 2-3 tablespoons of chimichurri per person), or allow your guests to dip their chicken in a small dip bowl of chimichurri. 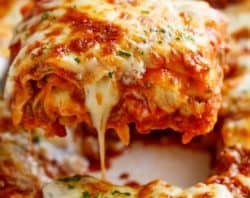 This looks absolutely awesome, I can’t wait to give this recipe a try. 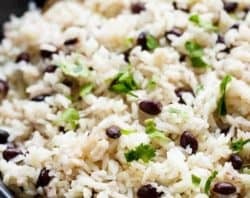 I love that you have the spice of chili in here, so zesty. What kind of red pepper is in the chimichurri? It is a red chili. Hope that helps! 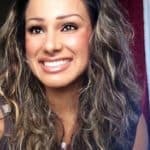 Thanks for following along with me! Could not possibly forget to give you an accolade about your Chicken Cacciatore recipe. The sauce was to die for. So smooth and silky with a taste so impressive it was a heavenly dining experience.